The peak of interest in crypto mining in the last months has apparently sparkled the need for some interesting new products designed to help the users of mining rigs get things done in a better and more efficient way. 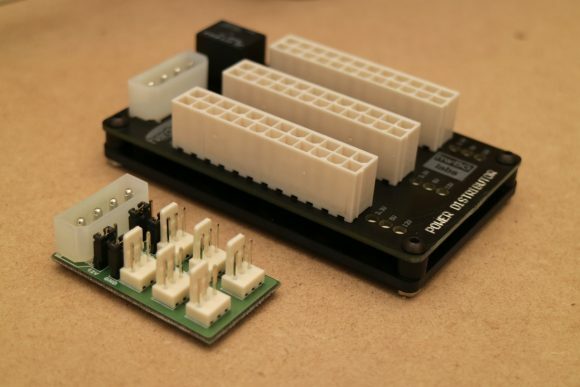 As a result we are seeing enthusiast designed things like a power distributor board allowing the users to connect up to 4 power supplies that can be used to work together powering a single mining rig. Of course you can always go for a 2x PSU boards such as the Add2PSU, but what if you need to connect three or four power supplies? 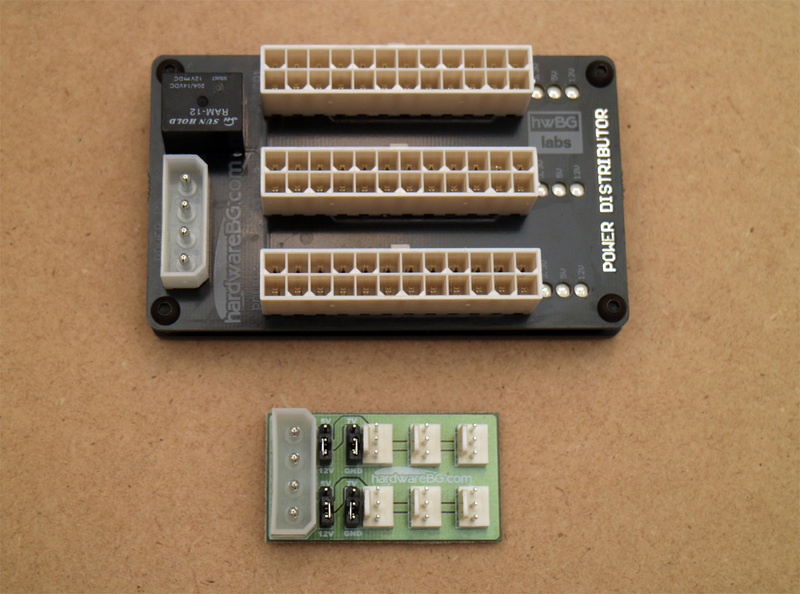 With Add2PSU you can use a number of devices to connect more power supplies together, but this will take up more molex connectors on the main power supply. Going for an optimized board that can use up to 4x power supplies together with a single molex from the main PSU is more convenient, especially if going for a 8x GPU mining rig with more powerful video cards that take up two PCI-Express power connectors. Another commonly needed thing for multi GPU mining rigs is an easy way to connect multiple cooling fans to go along with the video cards by helping them get cooler air and eliminate the forming of hot air pockets around the GPUs. 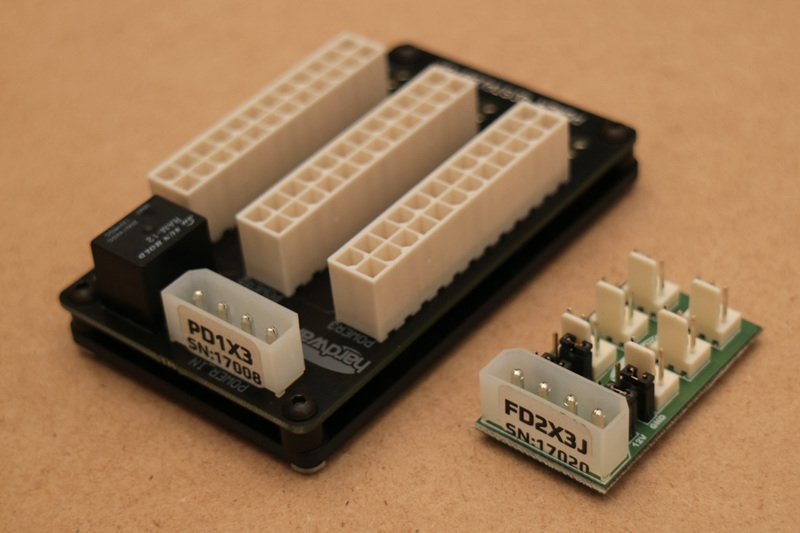 So getting an easy way to connect multiple fans, up to 6 for example via a single board powered by a 4-pin Molex power connector makes things much more simple and user friendly. Adding an easy way to select the operating voltages of the fans via jumpers and getting them to work at either 5V, 7V or 12V without the need of additional electronics is more than welcome. Of course you need not only to get good and useful functionality from a fan distributor board, but also make it affordable as with crypto mining extra costs are always considered. While enthusiast designed products like up to 4x power distributor boards for multiple power supplies for a single computer or fan distributor boards with 6x fans and voltage control option may be interesting for regular users, however the real market for devices like these has opened with the boom of GPU mining rigs. The two boards that we are showing you here are just an example, there are other interesting products getting designed by enthusiasts for the crypto mining market as well. An interesting example of other such products is the SimpleMining SimpleRigResetter that allows for easy power cycling of multiple GPU mining rigs if they have an issue and hang up.